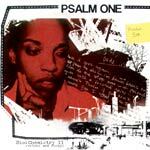 Psalm One is the next level of female emcee! Formerly a member of the Chicago crew Nacrobats, she has been releasing music independently for nearly 4 years recording with Casual (Hieroglyphics), Brother Ali & Ant (Rhymesayers), Illogic, Maker, Overflo, Offwhyte and Thaione Davis, among others This album was originally released in 2002 independently, but now is being released through Birthwrite with 5 new exclusive songs & new artwork! Production: Overflo on track 1; Yoda on tracks 2, 5, 10, 13, 14, 17 & 18; Polyphonic on track 3; Sm. Arson on tracks 4, 6, 11, 12, 15 & 16; Seandamon on tracks 7 & 9; K. Crump on track 8; Sm. Arson and Overflo (cuts by DJ Spontaneous) on track 16. 2. Where'd You Come From?